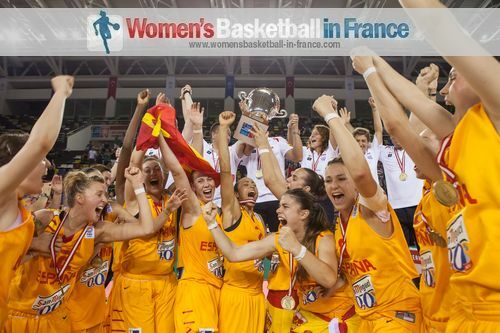 Spain are the FIBA Europe U20 European Champions for the third consecutive year. A 20-3 run during the third quarter was all that Spanish coach Anna Caula Paretas needed for Spain to take command of the final. Spain went to beat Italy (59-53) with an impressive 8-from-16 shots from behind the three-point line. Astou Ndour, who won the MVP award, picked up 17 rebounds while Yurena Diaz led all scoring with 15 points. Turkey did not leave the competition empty handed after beating Belarus in the third place match (53-38) in the bronze medal game. 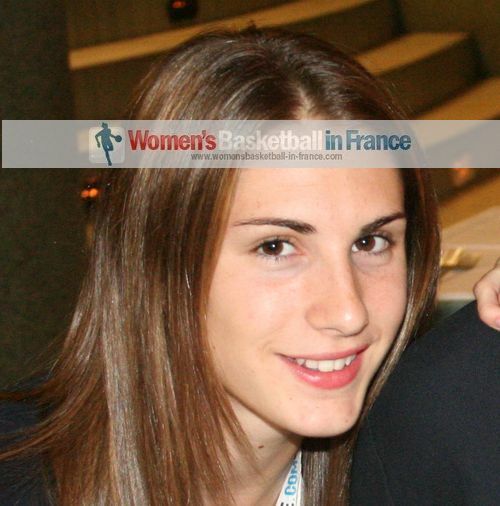 The FIBA Europe all tournament team for the 2013 European Championship for Women Division A is: Olcay Cakir (Turkey), Francesca Dotto (Italy), Artemis Spanou (Greece), Inmaculada Zanoguera (Spain) and Astou Ndour (Spain). Within less than four minutes in the game Italy started with 8 unanswered points shared between the Dotto twins and Alessandra Formica. The Spanish coach then reacted and called an immediate time-out which resulted in Astou Ndour scoring her first points of the match to spark a 7-0 run. The pace of the game increased while both teams traded baskets for the rest of the quarter. With Italy's pressing they managed to go into the second quarter ahead (18-11). Spain who had lost their point guard Inmaculada Zanoguera with 2 fouls in the first quarter had Elena De Alfredo hitting big scores to almost close the gap between the two teams. But Italy continued hustle plays to maintain their advantage (22-17) mid-way through the quarter. Yet Spain started to win the one-on-duels and with a three-pointer by Yurena Diaz (20-24) the pendulum was swinging in favour of Spain. Antonino Molino, the Italian, coach called his first time-out to break his opponents' rhythm. Italy appeared to gain the upper hand again with a long baseline jumper by Elisa Penna off the nice work of Caterina Dotto (28-22). Yet again Ndour came to the rescue with an "And-I" play for the last 3 points of the first half. Italy went into the break ahead (28-25). Apart from a three-pointer by Yurena Diaz to level the tie (28-28), the first five minutes of the third quarter turned into a contest of air balls. Spain started to find their scoring touch and moved 11 points clear (37-28) after a three-pointer by Itziar Llobe with two minutes to play in the quarter. 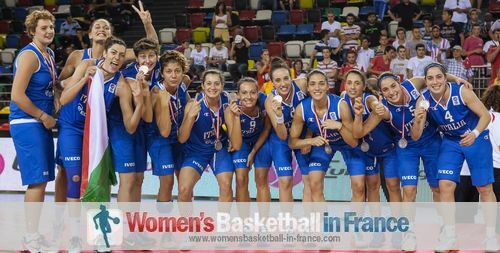 Italy finally got on the score board in the second half with a free throw by Penna before C. Dotto added a couple more. But Spain were flying with Paula Estebas ending the quarter with a three-pointer on the buzzer (45-31). Italy started scoring in the final quarter. 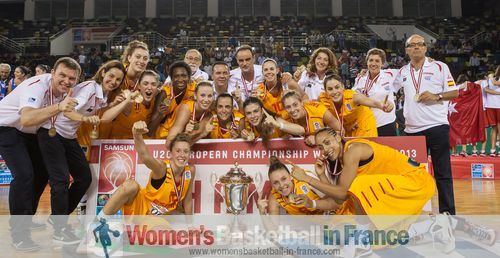 Yet it was case of too little too late as Spain held on to win (59-53) and to win another FIBA Europe winner's trophy. 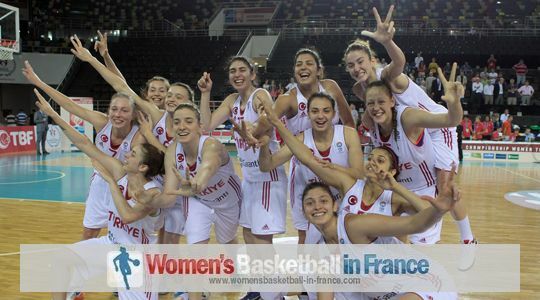 Turkey repeated their feat of 2012 by winning a bronze medal at the FIBA Europe 2013 U20 European Championship for Women Division A. They comfortably beat Belarus (53-38) in a match that fizzled out at the second quarter. In a crisp first quarter in which neither team played well, Turkey scored the first 4 points to stay in front (15-6) going into the second quarter. Then Turkey stepped on the turbo with runs of 6-0 and 8-0 to build up a comfortable lead by the interval (32-14). The third quarter turned into an exhibition match. The main highlight was a three-point buzzer beater by Büsra Akgün to extend Turkey's advantage (46-26) going into the last quarter. Aziz Akkaya, the coach from Turkey, gave players that had not played much in this tournament a chance to participate while Aliaksandr Shymkaviak did likewise to close the game. Christelle Diallo led France with 17 points each. The Slovak Republic defeated a depleted Serbia (68-56) in the game for 7th place. A (17-3) opening for the Slovak Republic was all that was needed to construct this victory. Greece beat the Netherlands (56-52) in the 9th place classification game. Ukraine finished their time in Samsun with a comfortable win against Poland (66-48) to claim the 11th place spot. Ellen Nyström made sure that Sweden defeated Germany (71-60) to keep their place in Division A. She scored 23 points, picked up 18 rebounds and dished out 7 assists. For Germany it is an immediate return to Division B.
Hungary avoided a FIBA Europe U20 European Championship whitewash by claiming their first victory of the tournament against Lithuania (72-51) to finish 15th. Amadea Szamosi compiled a double-double with 15 points and 10 rebounds. Vivien Böröndy and Szidónia Katona added 14 and 10 points for Hungary. Lithuania were led by Ieva Kazlauskaite who had 12 points.